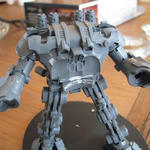 While I like the concept of the Dreadknight, and at first I didn't mind the terminator harnessed on the front, I've slowly realised that I don't like the terminator or the exposed exo-skeleton pistons on the arms. I also wanted to adjust the position of the legs so that it doesn't look quite so static. Today I found myself with a bit of spare time and decided to have a crack at it. 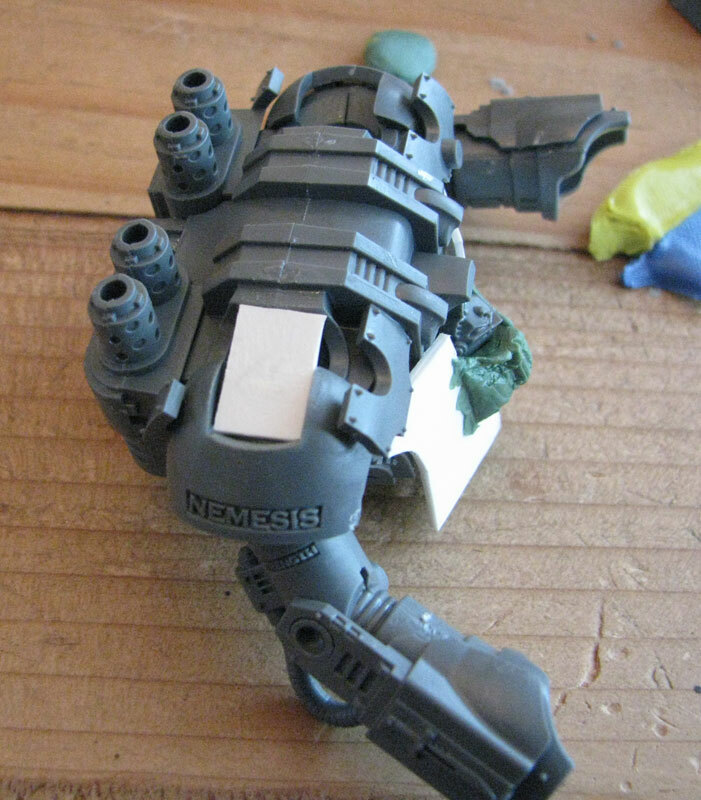 The legs were built pretty much as stock, although the front armour above the toe was left off (this will be used on the thighs to help fill in the gaps left by the missing terminator legs). The back hoses at the top which connect to the hip piece were clipped off as they would need adjusting when the legs were posed, and the rear toe was trimmed down a little to allow the front ankle to rotate far enough to move the front leg forward. Next the blocks at the top of the legs were snipped off and glued into the hip piece, and then the tops of the legs glued to them, and glue added to the ankles. The legs were left to set while the body was put together. 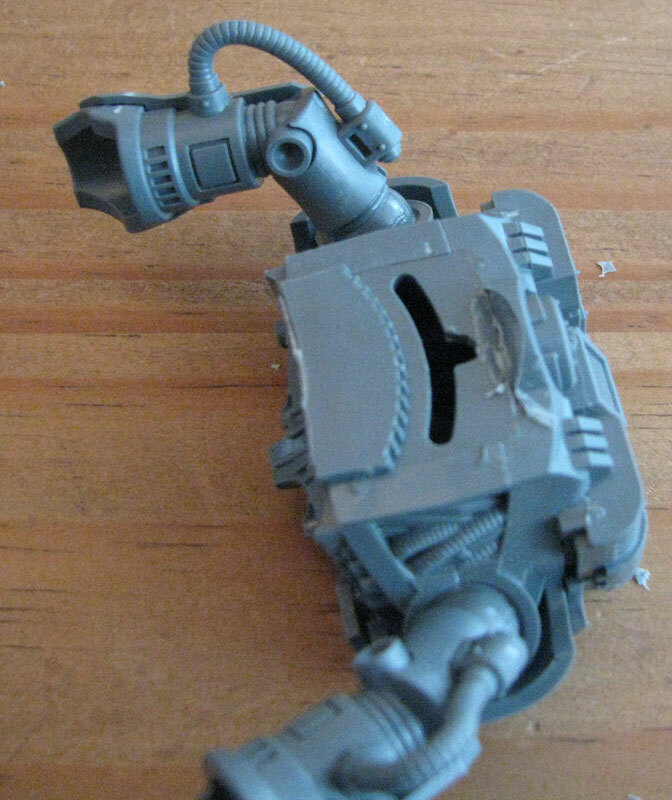 The body started off just as in the instructions, but the terminator was left off. 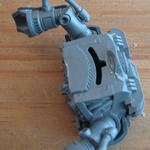 The area where the terminator fits was snipped off, and the slot underneath adjusted to allow the upper body to be fitted slightly more forward so that it didn't end up being back heavy. 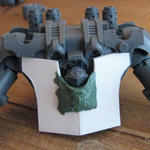 The shoulders where the pistons would fit were first covered with a strip of plasticard to save on using too much green stuff, and then green stuff was laid over it and into the recesses in the shoulder pads. 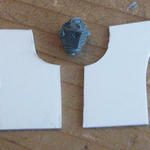 This was then smoothed off, they may later get some motifs added. 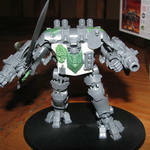 I didn't want to just slap on a Dreadnought sarcophogus but it was very tempting. 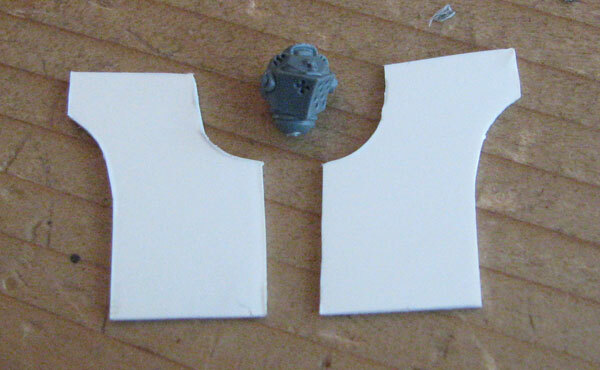 Instead two pieces of plasticard were cut to stick onto the front of the body covering the area where the terminator would be positioned, and the edges that would be glued together were chamfered to allow the two halves to stick together at an angle. 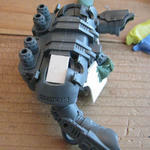 A blob of green stuff was then added to the front to replicate the terminator torso, but angled off at the bottom to more closely resemble the MkIV style Dreadnought sarcophogus feel along with the terminator head. 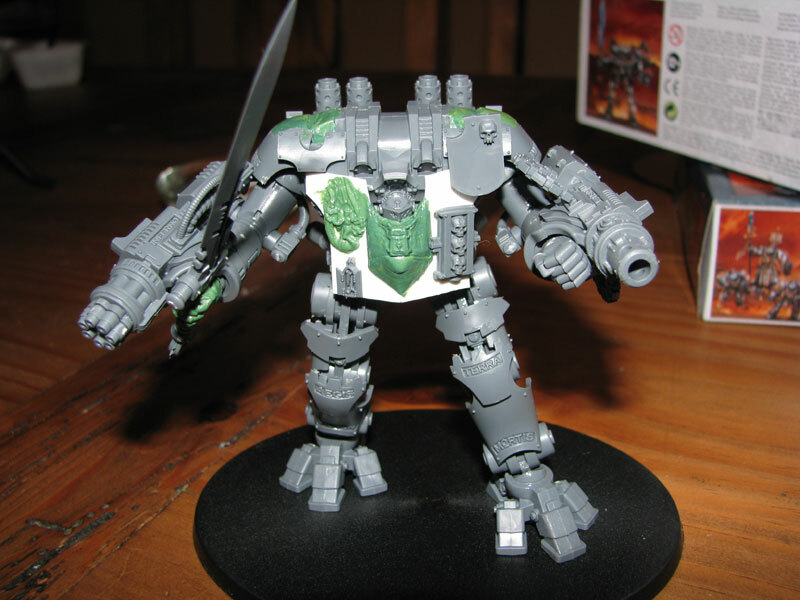 Either side of this I added a green stuff motif (it's an imprint from a shield included in the Dreadknight box), along with two parts from the Terminator box set - a relic box containing some bones, and a stylized I with skulls. 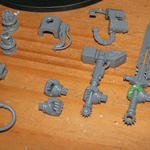 The weapons have been build so that the barrels and fittings can be swapped. 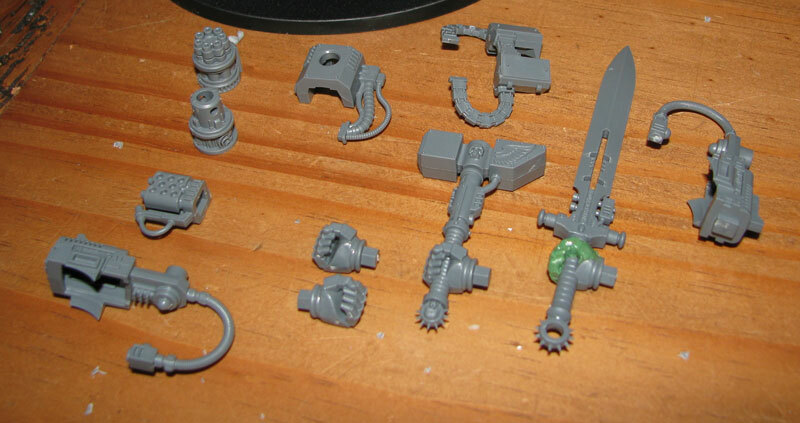 The next step with these will be to add magnets into the wrists and metal plates onto the fists/hammer/sword, and magnets onto the weapons with metal plates on the barrels and fittings. So there it is, the latest addition to my Grey Knights. 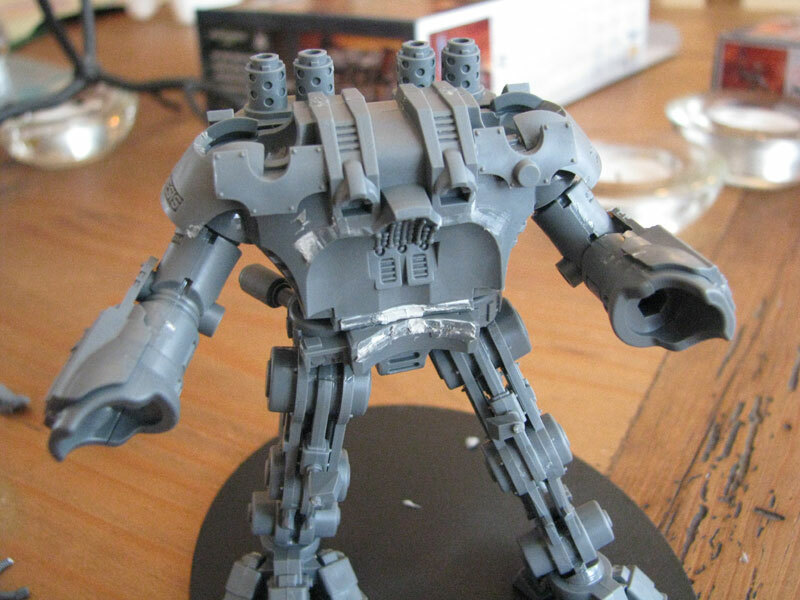 There's still a lot of work to do - filligree on the plasticard on the torso, probably motifs on the shoulders, and cleaning up mould lines. 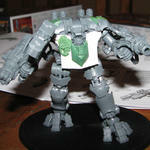 But for now I'm pretty happy with the way the torso has come out, although a larger head from the FW MKIV GK Dreadnought might look better. 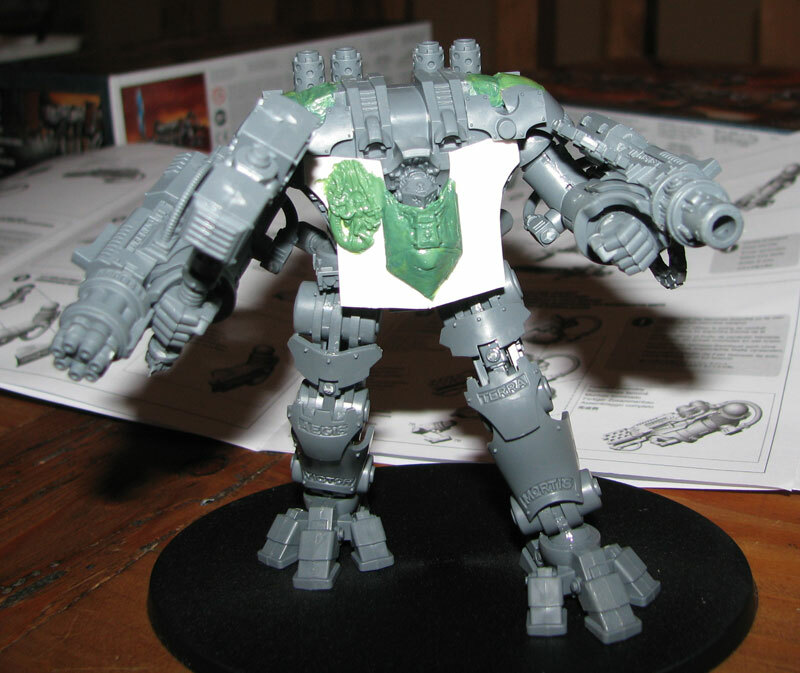 EDIT: Later today I'll look at mocking up a new front using the FW MKIV GK Dreadnought torso, just happens I have one on my shelf A bit of green stuff imprinting should do the job. Last edited by Spack on Sat Apr 16, 2011 5:30 pm, edited 5 times in total.